Here they are (in no particular order)...HG's top foods of 2005! We're gonna be straight with you here. We had completely given up on pasta until we were introduced to the wonders of Tofu Shirataki. Made of tofu and yam flour (it tastes better than it sounds), these noodlicious creations are high in fiber, VERY low in calories, and have ZERO points (if you're counting) for the entire package! It's essentially "pasta" with hardly any carbs or calories. That's complete and total insanity! Add these to your favorite soups, salads, or anywhere else you'd normally use pasta. We cannot possibly begin to explain to you how much we love and cherish these noodles. They WILL change your life. HG Heads Up! These are a little hard to find in stores but can be purchased online. As you know, we get super-excited every time we discover a delicious new snack bar. Especially if it has lots of fiber and is great for you. That's why Gnu Foods Flavor & Fiber Bar is our "gnu" bar obsession. We first tried these 130-calorie treats after some subscribers tipped us off about 'em. They come in three flavors - Cinnamon Raisin, Orange Cranberry and Banana Walnut. All are really good, but we like the Cinnamon Raisin best. Pssst... in case you count, these bars are just 2 points on Weight Watchers. Bob and David (founders of Sensible Foods) are sensible guys. They figure, why not take the goodness of real corn, and turn it into a perfectly sweet, crunchy snack? Awesome! These dried veggie treats are perfect alone, or on top of salads. And they come in convenient 70 calorie, 3g fiber bags (making them just 1 WW point if you count!). Even better is the fact that they come in a whole slew of fruit flavors, too, like Orchard Blend (apples, peaches and apricots), Tropical Blend (p<?fontfamily><?param Arial>ineapples, mangoes, bananas, and apples)<?/fontfamily>, and Cherry Blend (c<?fontfamily><?param Arial>herries, strawberries, and blueberries). Plus, these snacks are 100% natural - made with JUST fruit or corn. No oil. No preservatives. No NOTHING. These treats are available at some Whole Foods locations, but they're a little hard to find in stores. For now you can order them online at </FONT><A href="http://www.sensiblefoods.com/crunch_dried_fruit_snacks.htm" target=_blank><FONT face=Verdana>sensiblefoods.com</FONT></A><FONT face=Verdana>.</FONT></P></TD> <TD width=25></TD> </TR><TR> <TD width=29></TD> <TD height=25></TD> <TD width="5" height=20></TD> <TD width="343" height=20></TD> <TD width="5" height=5></TD> <TD height=20><p> </p> </TD> <TD width=25></TD> </TR></TABLE></TD></TR><TR> <TD colSpan=7 height=15 bgcolor="#FFFFFF"> <TABLE cellSpacing=2 cellPadding=2><TR> <TD colSpan=7 height=15 bgcolor="#FFFFFF"></TD></TR><TR> <TD width=29 bgcolor="#FFFFFF"></TD><TD valign=top style=" COLOR: #000000; FONT-SIZE: 13px; FONT-FAMILY: Palatino Linotype, Georgia, Times New Roman; LINE-HEIGHT: 16px;" colSpan=3 bgcolor="#FFFFFF"><SPAN style=" FONT-WEIGHT: bold; COLOR: #000000; FONT-SIZE: 14px; LINE-HEIGHT: 18px; FONT-FAMILY: Palatino Linotype, Georgia, Times New Roman;">CocoaVia</SPAN><br><br><P><STRONG><FONT face=Verdana>(Serving Size: 1 C<SPAN style="FONT-WEIGHT: normal; FONT-SIZE: 9px; LINE-HEIGHT: 18px; FONT-FAMILY: Palatino Linotype, Georgia, Times New Roman"><FONT size=2><STRONG><FONT face=Verdana>rispy Chocolate Bar</FONT>: <FONT face=Verdana>90 calories, 5g fat, 10mg sodium, 11 carbs, 2g fiber, 7g sugar, 2g protein</FONT></STRONG><FONT face=Verdana>)</FONT></FONT></SPAN></FONT></STRONG></P><STRONG><SPAN style="FONT-WEIGHT: normal; FONT-SIZE: 9px; LINE-HEIGHT: 18px; FONT-FAMILY: Palatino Linotype, Georgia, Times New Roman"> <DIV><FONT face=Verdana size=2>We HEART </FONT><A href="http://www.cocoavia.com/" target=_blank><FONT face=Verdana size=2>CocoaVia</FONT></A><FONT face=Verdana size=2>. Not only have they made the first calcium and vitamin-packed chocolate bar that may actually <EM>lower</EM> your risk of getting heart disease, but their good-for-you chocolate bars are also delicious. Lusciously rich and creamy, CocoaVia's Crispy Chocolate Bar is like the grown-up, more sophisticated, better tasting version of a Nestle's Crunch Bar. And, unlike the crunch-happy folks at Nestle, CocoaVia knows a little crunch goes a long way. You'll notice that the serving size of this bar is about half that of the Nestle bar, but don't fret. CocoaVia's 90 calorie bar is so much more satisfying. Note: These bars come in other flavors, like Blueberry & Almond, and in a lighter, lower-cal snack bar version. Yum! If you're anything like us, you go absolutely NUTS over french fries. And you probably know your way around a sweet potato fry or two, as well. But did you know that you can make crispy, wonderful, sweet fries out of our new best friend, the butternut squash? Well, you can. And you NEED to. Because Hungry Girl has created, without a doubt, our most favorite (and also our easiest) recipe ever. Click here to see it. We LOOOVE potato chips, so we never get tired of all the new chip swaps that keep showing up on the shelves of our local market. We're especially excited about Guiltless Gourmet's brand new line of potato-rific crisps. These new baked snacks have just 100 calories per serving, and come in 4 great flavors -- Au Gratin, Pico De Gallo, Memphis BBQ, and Sea Salt. In the past, Guiltless Gourmet has been hit or miss with their chip snacks (some of their tortilla chips are a bit cardboardy, if you ask us), but these are FANTASTIC! The best part is, they're easier to find than most other potato chip swaps - they should be at a supermarket near you right now. Chip chip hooray! It doesn't have to be Cinco de Mayo to enjoy a tamale pie, does it? No way! 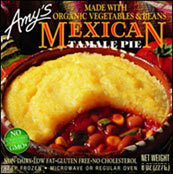 Especially if the tamale pie has just 150 calories (and 2 points, if you're counting). This organic, unbelievably delicious, authentic Mexican treat is a yummy mix of pinto beans, corn, zucchini and crushed tomatoes, all topped with a light polenta. Yum! This is one of our favorite things to come out of Amy's magical kitchen (and that's saying something because we REALLY love Amy's). Try one of these low fat, high fiber frozen treats...they're the perfect light lunch, snack, or a GREAT addition to any dinner. Fantastico! Are you a fan of onion rings, Funyuns, or those greasy fried onion things you toss on top of casseroles during the holidays? If you answered YES to any of these Qs, you'll want to get your mitts on some new Crispy Delites Red Onion snacks! All natural, and made with nothing but red onions, canola oil and sea salt, these crunchy wonders have just 110 calories and 2.5g of fat per bag. And they manage to cram in 3g of fiber, too. That adds up to just two points if you're counting. You can even use them to make groovy guilt-free green bean casseroles. Did you think we would actually do a Top Ate (ok, ten) list of our favorite foods of the year and forget the ever-popular Hungry Girl developed Double Chocolate Dream VitaTops? Not a chance! These white-chocolate studded chocolate muffins have been selling through the roof. And with good reason. They have only 100 calories, hardly any fat, and they're PACKED with fiber. In case you didn't know, after 98% of the subscribers who took our poll about whether or not these formerly limited edition muffins should go away or stick around voted to keep 'em, Vitalicious decided to add these to their regular lineup. So, we're being a little self-congratulatory here. We know it. But we're proud. And these muffin tops taste soooo goooood. December 24th, is National Eggnog Day. Silk Soy Nog is a healthy way to satisfy your need for nog! Hey...Tune it to KYGO in Denver tomorrow (Friday) at 7:40am PT to hear Hungry Girl LIVE on the radio! You can stream it live at kygo.com. Just get there early enough to register. Weeeeee! REMINDER: There will be NO HG emails next week. We'll be back on Tuesday, January 3rd. Happy Holidays!